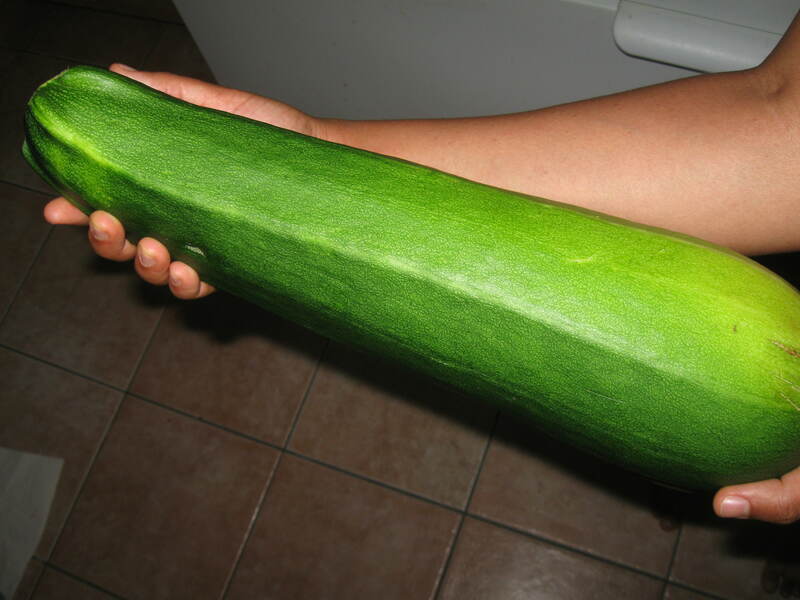 It’s as big as my forearm! And was mighty tasty despite its size. 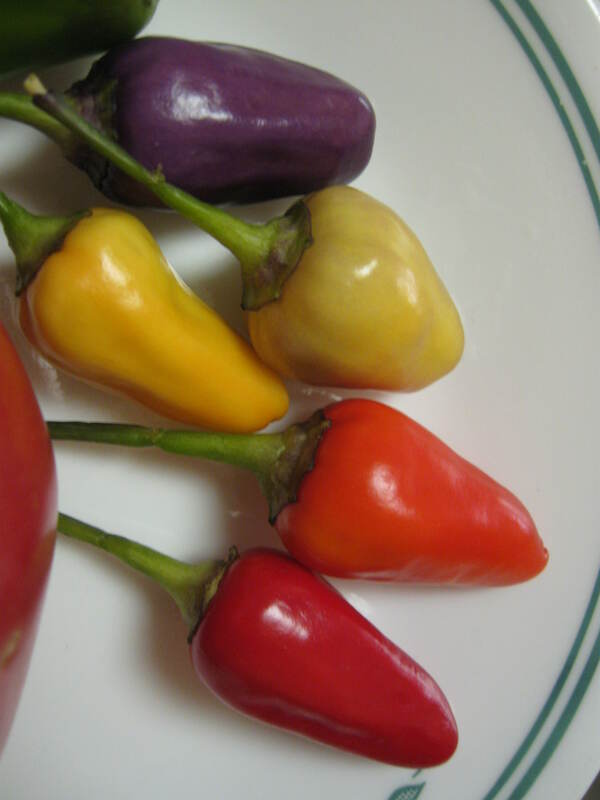 All stages of the 5 colour Chinese peppers: purple, white, yellow, orange and red! Critters 2: … and the ugly! I came across these cute (and gross) creepy crawlies last Friday. They were all over the kale in the greenhouse. At the time I thought they were caterpillars but I later learned, through a lot of Google image searching, that they are cabbage worms or cabbage loopers. 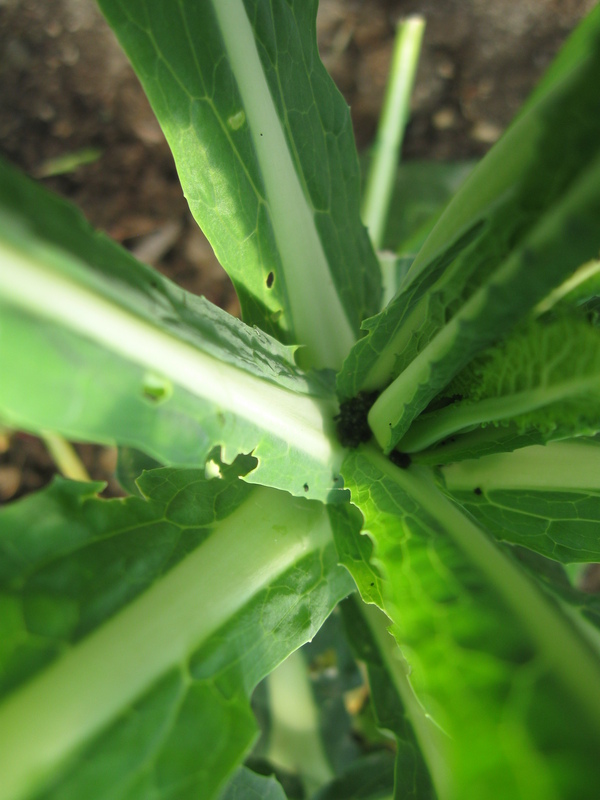 They attack brassica family plants, such as the kale and collard greens that are currently in the garden. These guys hide in plain site. I almost didn’t see them, and then I saw a ton of them! 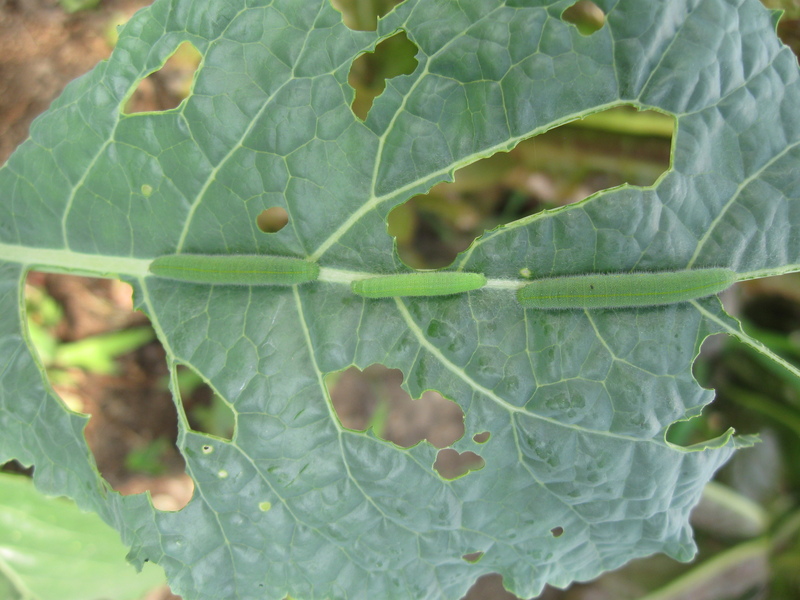 According to About.com, the worms are the larva of the cabbage white butterfly. As soon as I read this, I remembered chasing a little white butterfly with my camera as he fluttered through the garden not long ago. At the time, of course, I thought it was so cute. Little did I know, their larva are the ultimate ugly. What’s ugly is the amount of damage these little buggers can create. Unbelievable. They’re eating the kale right before my eyes! I thought about picking them directly off the plants but I couldn’t bring myself to handle their soft, squishy bodies with my bare hands. Stroking their backs was as brave as I could get (they’re furry!). Seeing their little mouths chomping on the kale was another deterrent from picking them up. I didn’t want to get bitten :). 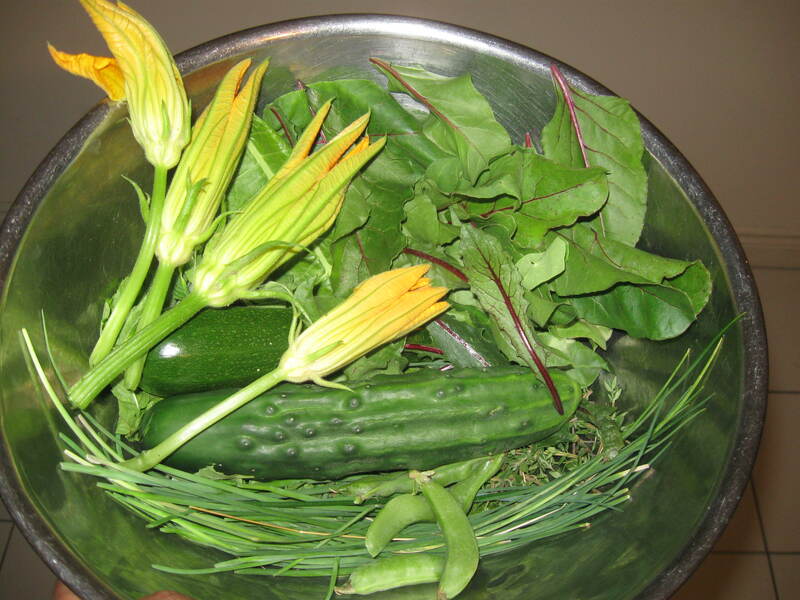 I came across this interesting post yesterday by Urban Organic Gardener while I was searching for information about cabbage worms. His post showed that the black spots in my picture below are actually worm poo and not aphids as I’d thought. That’s a lot of poo, which can only mean — a lot of worms! Nooo! I managed to pick up a copy of Grow Great Grub and You Grow Girl by Gayla Trail from my local Hamilton Public Library branch. I remember the books having sections on organic pest control (as most gardening books do) that I had ignored in the past but now I desperately wanted some reliable info on cabbage worms. 1. 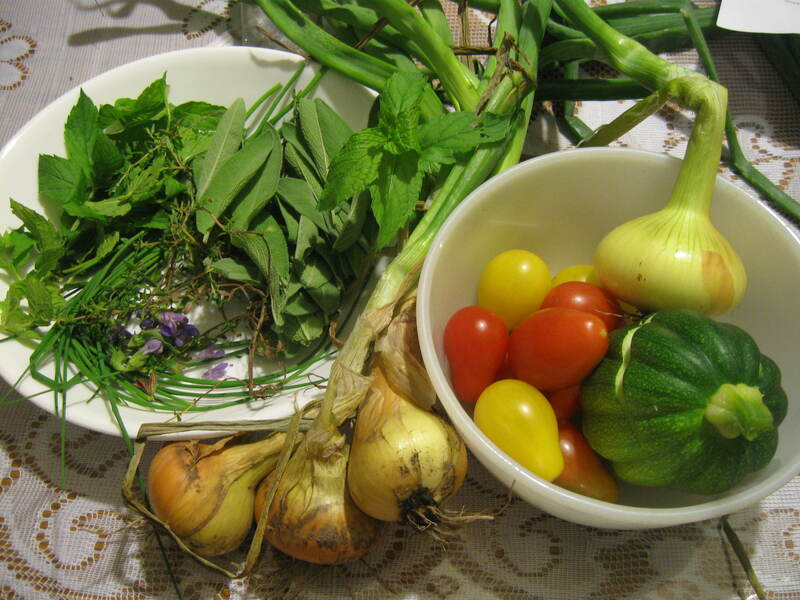 Companion planting – with items such as Aster family flowers (which if Wikipedia can be believed includes sunflowers, yarrow, and calendula), onions, and sage that either deter the worms or attract insects that will prey on them. Note that the examples I used are all growing in my garden. The sunflowers and calendula are close by but they aren’t in full bloom yet. 2. Use floating row covers to keep the butterfly from laying its eggs on your brassicas. 3. Handpick the little buggers off of your plants. First calendula bloom of season. 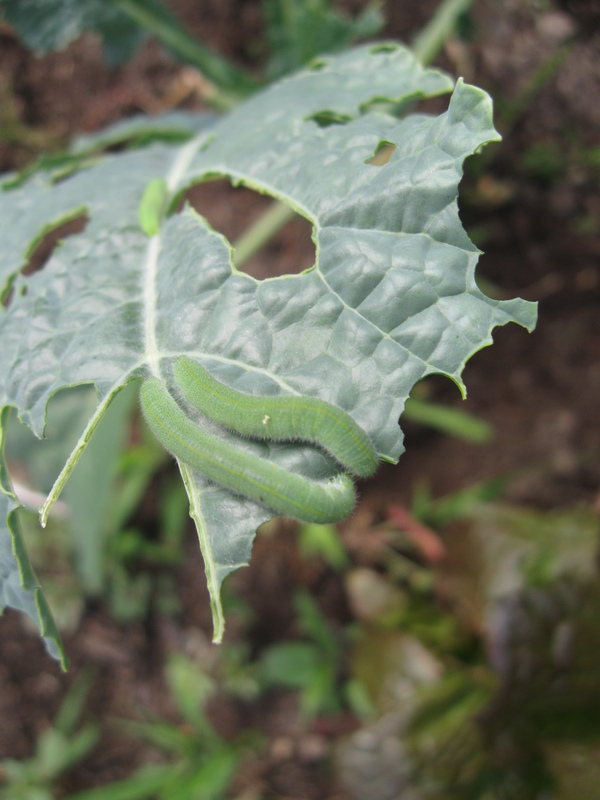 Hopefully it will attract some predatory wasps to eat the cabbage worms. 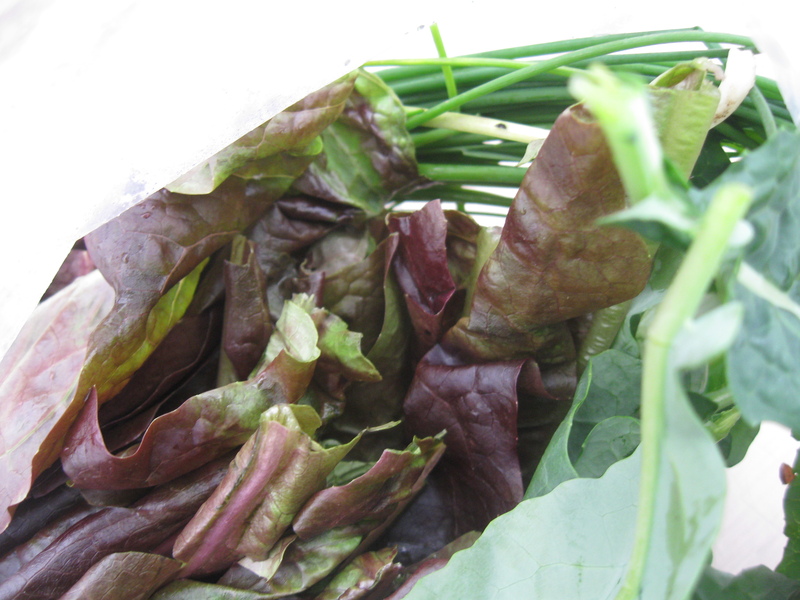 I took home some collard and beet greens last Friday. When I got around to washing them on Sunday, I found two worms had hitched a ride and survived the fridge (well, one was moving in the water; the other wasn’t). A clear reminder to check my leaves carefully before I bag them. 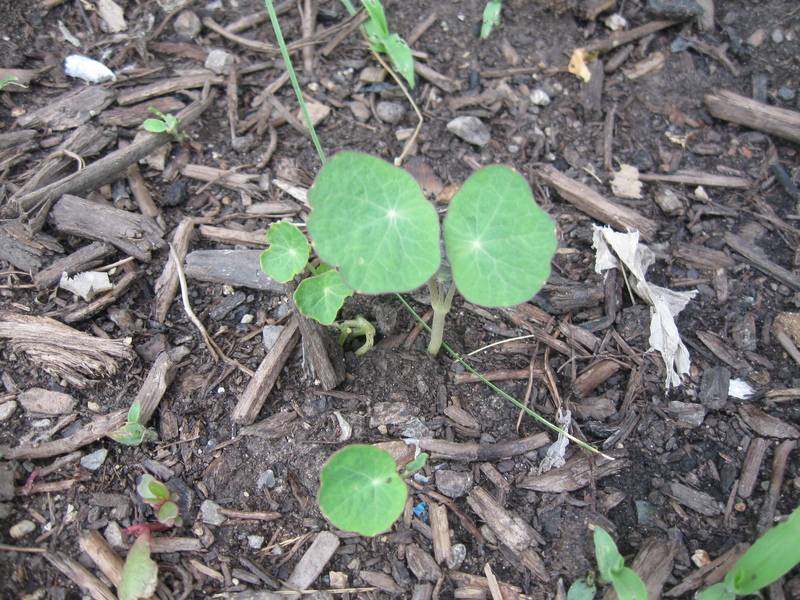 It’s taken about 3 and a half weeks, but the nasturtium is finally starting to show itself. I’m really surprised because I’d read they were pretty easy to grow and would start to germinate 7 to 10 days after being planted. I’m glad I kept putting down new seeds every week and lots of them. If things are going to be this slow going all season, it won’t get to a size where it can be beneficial in the garden as a flowering plant that attracts pollinators or an aphid trap. 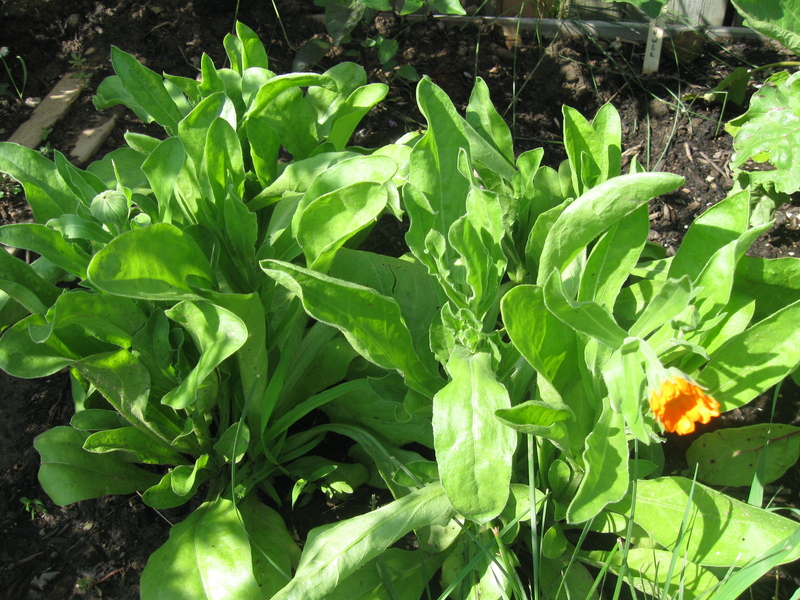 The calendula are coming along, but the borage and cornflower haven’t come up at all. I think the borage is not getting enough light as they like full sun and I’ve planted the seeds on the shady side of the sage bush. The cornflower are just over run by weeds. I’ll have to weed and do a new planting. 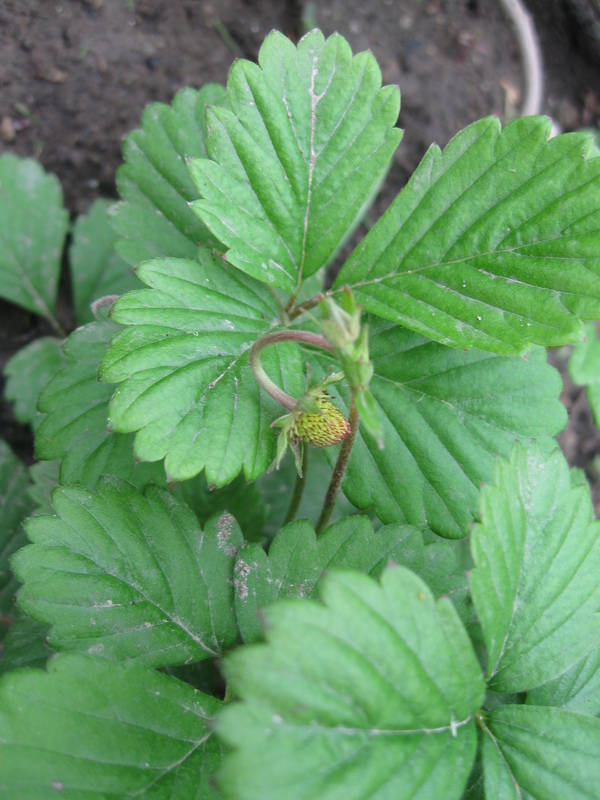 Strawberries are coming along as well. 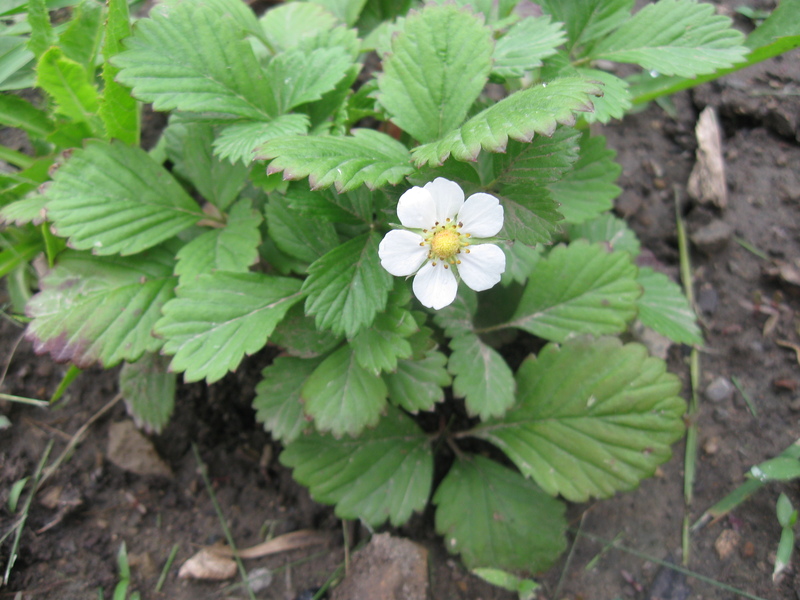 Some interesting information about alpine strawberries from Vegetablegardener.com. Apparently I’ll be able to tell when they’re ripe by their smell, which is supposed to “rival the most intoxicating of flowers”. I don’t think I added kelp meal to the strawberries like I did with the other transplants. 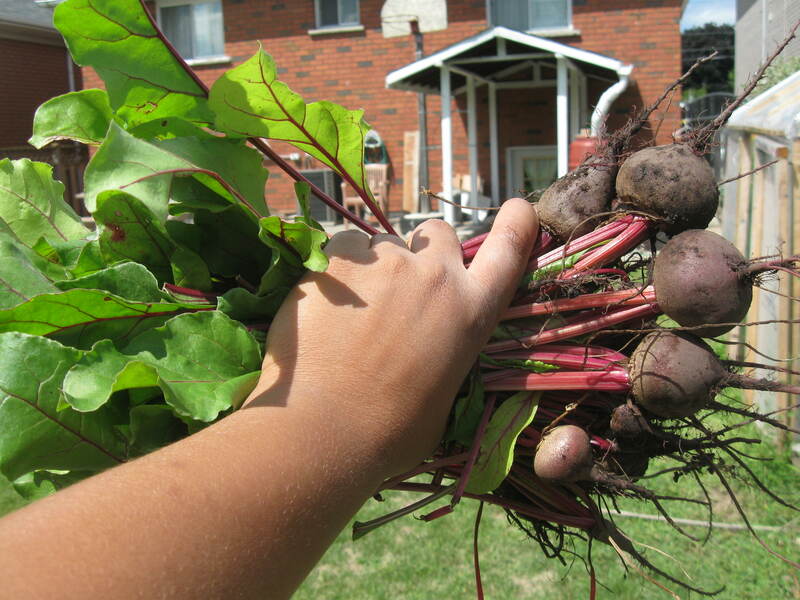 The article mentions that they like fertile soil with lots of organic matter. 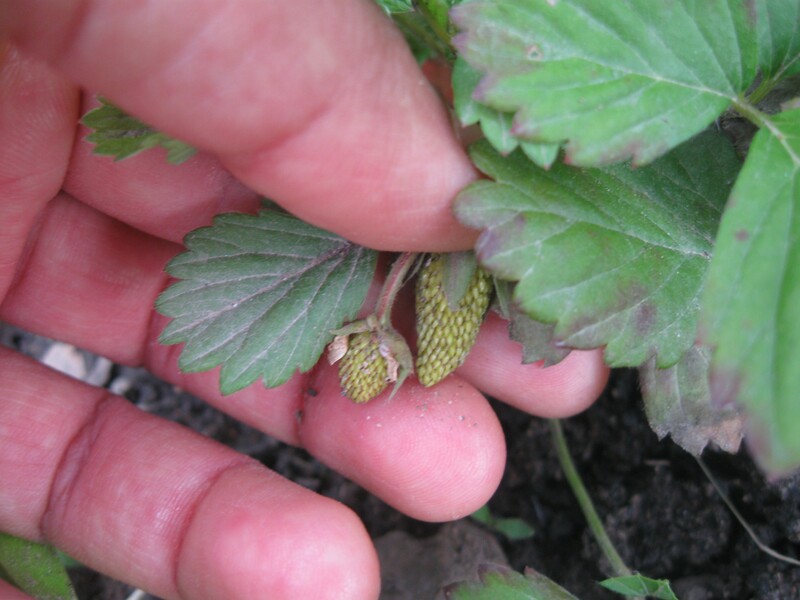 A tiny little strawberry bud at the centre of this flower. So cute! Wonder how long before they are edible? Sage is the one plant that’s done amazingly well in my uncle’s back yard. You’ll notice some mint mixed in among the sage leaves. I’ve been enjoying mint tea the past few nights. My aunt tells me I should boil the leaves so the tea will be stronger, but I’ve never heard of that. I’ve been steeping the leaves in boiling water in a covered teapot . It’s pretty good after a few hours (I’m enjoying some right now!). I took some sage leaves home to Toronto last weekend for the purpose of making tea but I haven’t used them yet. 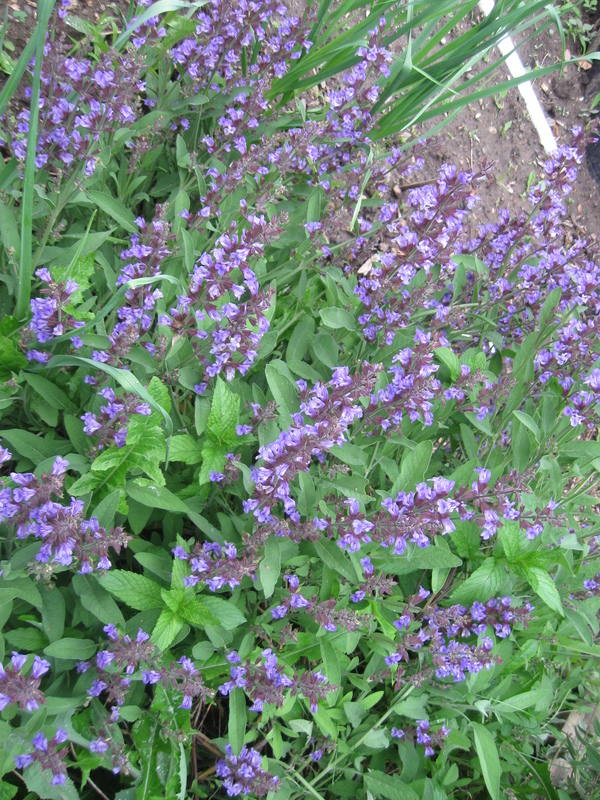 Sage – who knew it had such beautiful flowers! 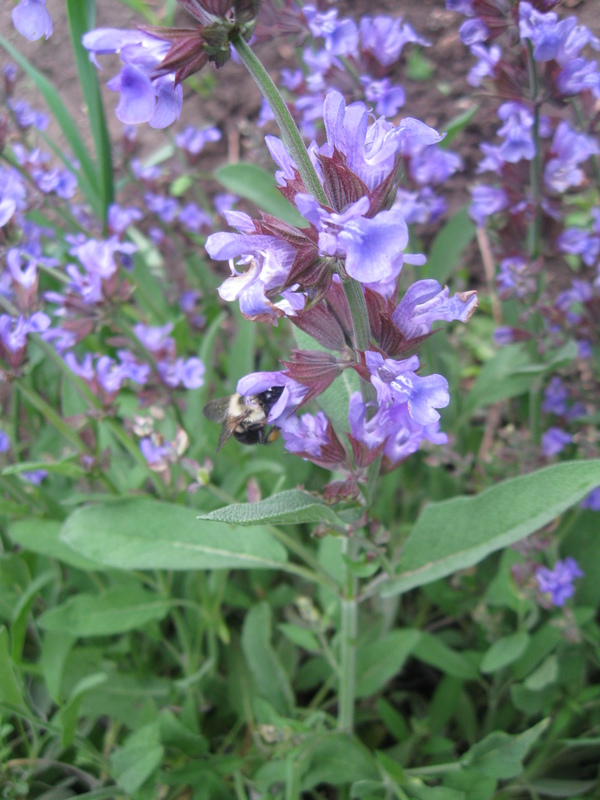 The sage has been picking up the slack for the edible flowers in attracting pollinators. I noticed this bee last Friday. He didn’t stick around for very long. Maybe he didn’t like getting his picture taken; I was following him pretty closely with my camera. The best sight this past week — hands down! 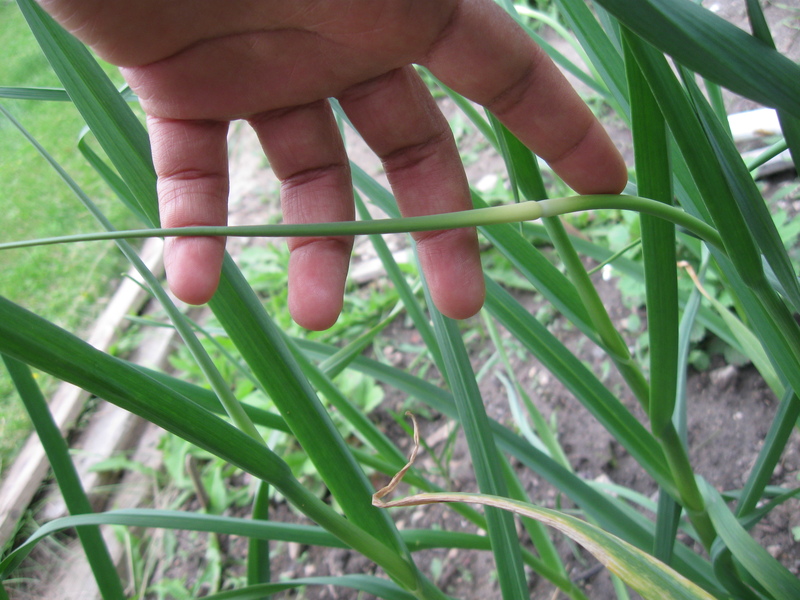 — has been the appearance of garlic scapes! A bit about garlic scapes from About.com. The ones in my garden are still young. 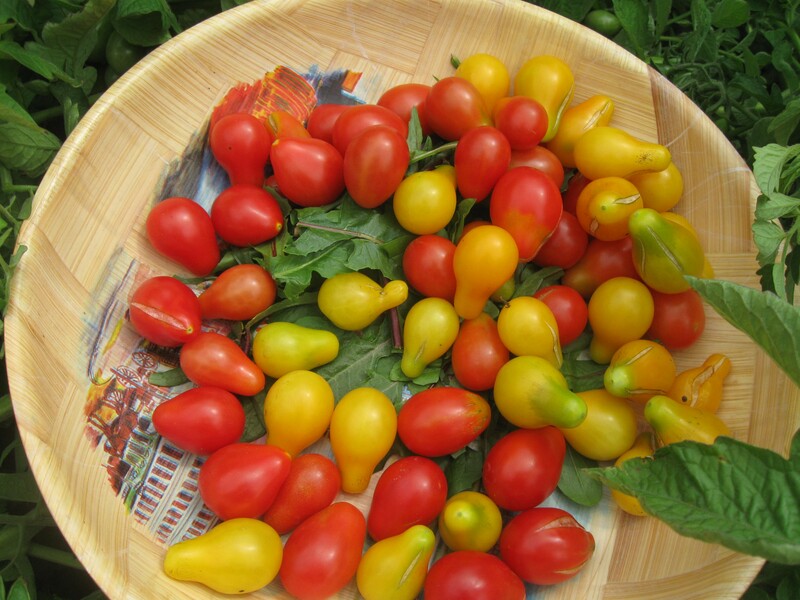 I had been told in the past that they are ready to harvest once they start to curl, but this article says they will be nice and tender if harvested young. 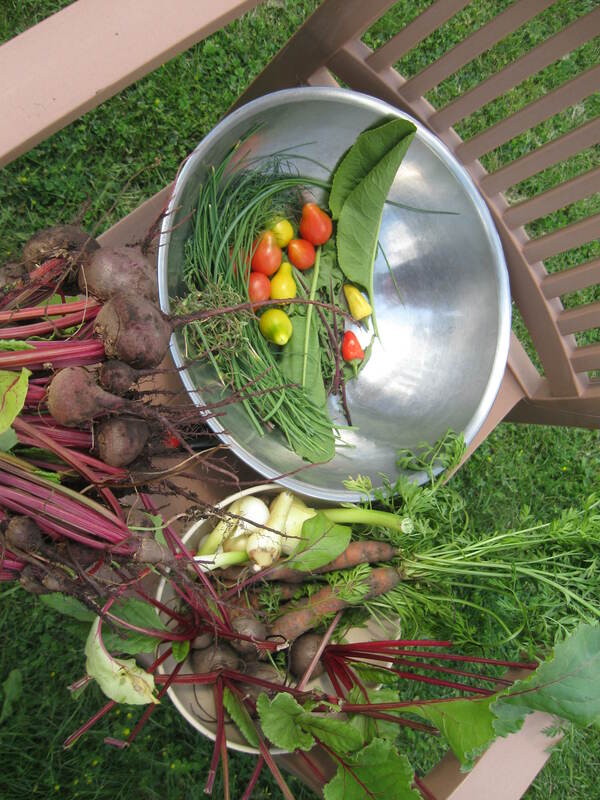 Harvesting the scapes puts more energy into bulb formation, which is what we want. A little taste of garlicky heaven! I used to roll my eyes when foodie friends talked about garlic scapes (foodie, I am not) — until I tasted them. 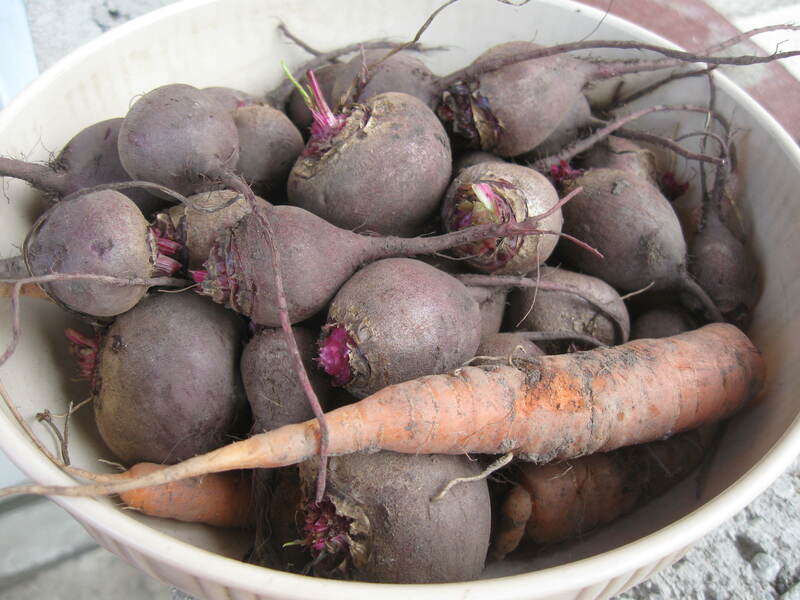 They have been the most flavourful product to come out of my garden to date. If you love garlic, you’ll love scapes. If you’re not a big fan, you might enjoy the milder flavour of the scapes.